Eläintarhan ajot 1959, (kuva kirjasta Kuolemankurvasta Moukaripörssiin, kopioitu Moottoriurheilumuseoyhdistyksen luvalla). Kuvassa oleva auto on DBR1 (valmistenro DBR1/5, rek. 900 BH), vaikka kuvateksti ilmoittaakin sen olevan DB3S. 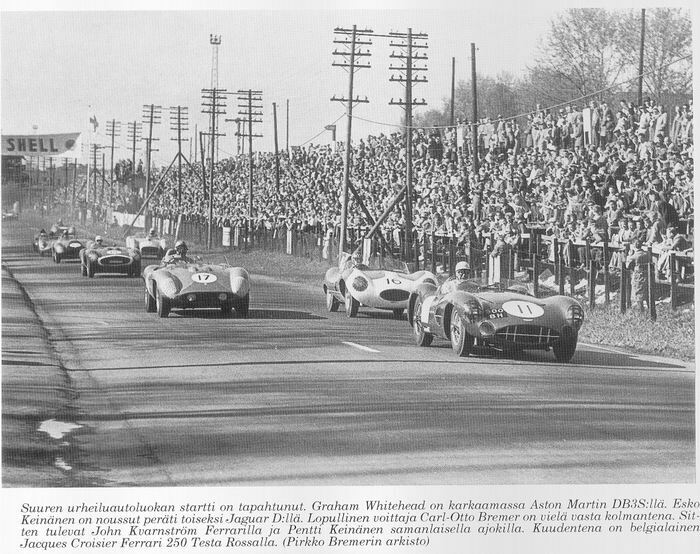 Graham Whitehead (GB) won the Eläintarha race in 1958 with a DB3S, one of the most successful examples that he brought to second place with his brother Peter in Le Mans the same year, chassis no DB3S/6, reg. 62 EMU. 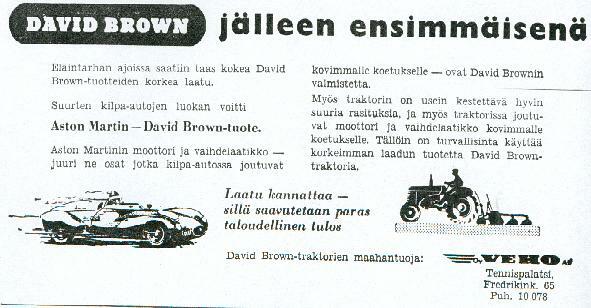 The importer of David Brown tractors took advantage of this in their advertising (picture below). Comprehensive film footage of the whole 1958 event from this link. Graham Whitehead sijoittui vuonna 1959 kokonaistuloksissa toiseksi DBR 1:llä (sivun ylin kuva). 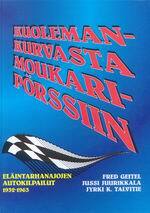 Samanlaisella autolla voitettiin Le Mansin 24 tunnin kilpailu ja World Sportscar Championship samana vuonna. Graham Whitehead also finished second in the same race in 1959 but with a DBR 1 (chassis DBR1/5, reg. 900 BH, the first picture on top of this page). The same year Aston Martin won the World Sportscar Championship and the Le Mans 24 Hours with similar cars. Ennen vuotta 2002 oli Suomeen rekisteröity uutena vain yksi Aston Martin. Kahvitehtailija K.V.Sukki (OKA-Kahvi) toi 15.6.1951 maahan uuden DB2:n, väri oli sininen (swiss blue) ja sisustus sininen. Auto toimitettiin oikeanpuoleisella ohjauksella mutta tehdasvarusteisella kilometrinopeusmittarilla. 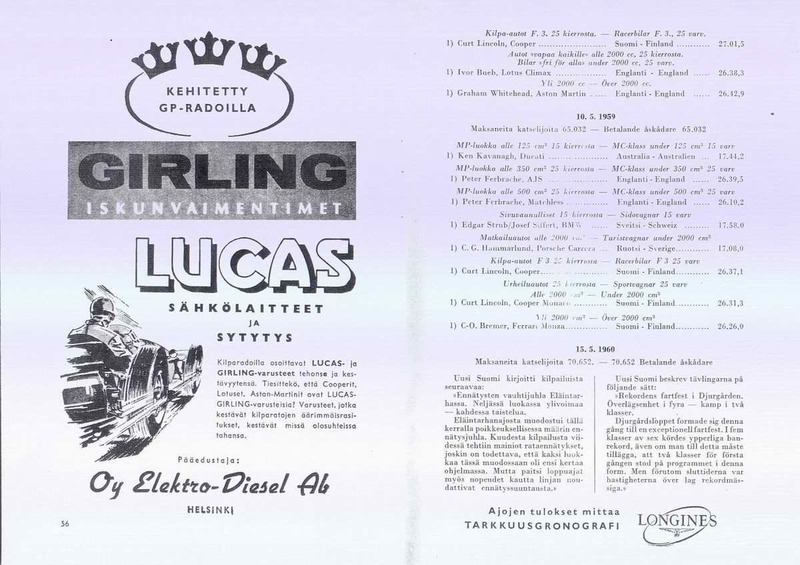 Sukki palkkasi Walter Bergströmin ajamaan autolla kilpailuissa ja sillä osallistuttiinkin Eläintarhan ajoihin vuonna 1953, sijoitus oli neljäs yli 2000 cm3 sarjassa. Yle arkiston filmissä n. 5 min kohdalla auto erottuu selvästi avoautojen joukosta. 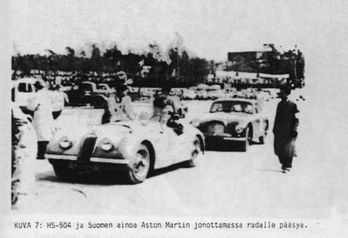 Lisäksi autolla kilpailtiin Jyväskylän Suurajoissa 1953 ja se ilmoitettiin Monte Carlo Ralliin vuonna 1952 mutta ei kuitenkaan ottanut osaa. Auto on edelleen Suomessa, nykyinen omistaja on hiljattain aloittanut vaativan entisöintiprojektin. 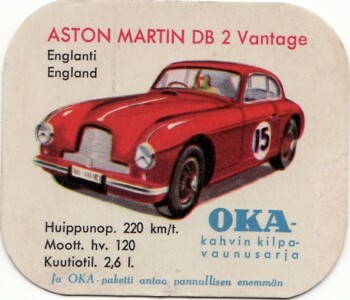 Before 2002 only one new Aston Martin had been registered new in Finland. On 15.6.1951 coffee factory owner Mr K.V.Sukki (OKA-Coffee) imported a swiss blue DB2 with blue interior. The above images are from the OKA-coffee sportscar collector cards from the 1950’s. The car was right-hand drive but equipped with a km-speedometer. 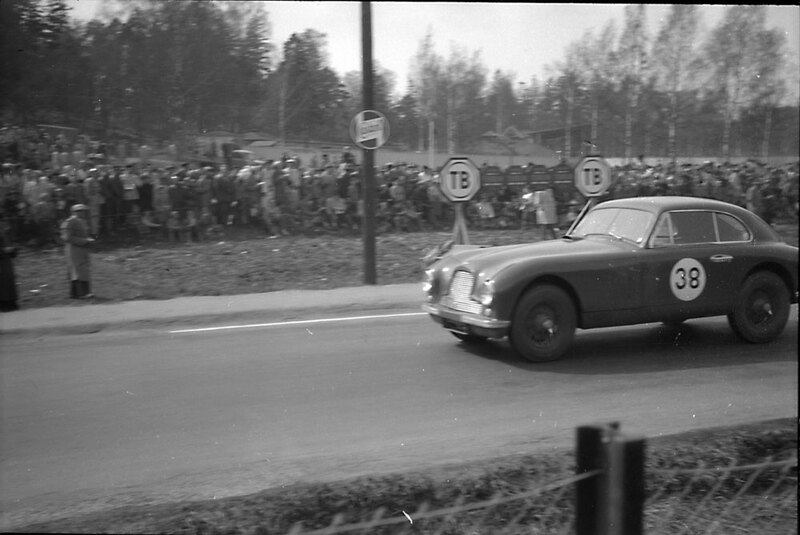 Sukki hired Mr Walter Bergström to drive the car in competitions and 1953 it finished fourth in class in the ’Eläintarha Race’ – the most important race of its kind in Finland at the time. In this archive footage the car is easily identified among the other mostly open top competitors. 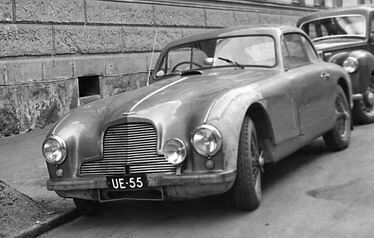 The car also competed successfully in the 1953 Jyväskylä Thousand Lakes Rally and was entered in the 1952 Rallye Monte Carlo but didn’t take part. The car is still in Finland and the present owner has started the demanding restoration project. 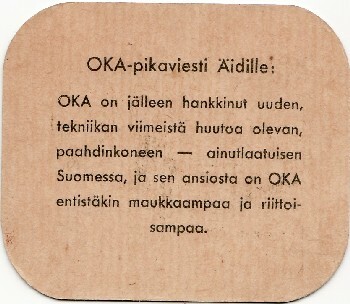 vasen kuva otettu todennäköisesti 1950-luvulla (Mobilisti-lehti / Börje Dilén), kaksi muuta Eltsun ajoista 1953. 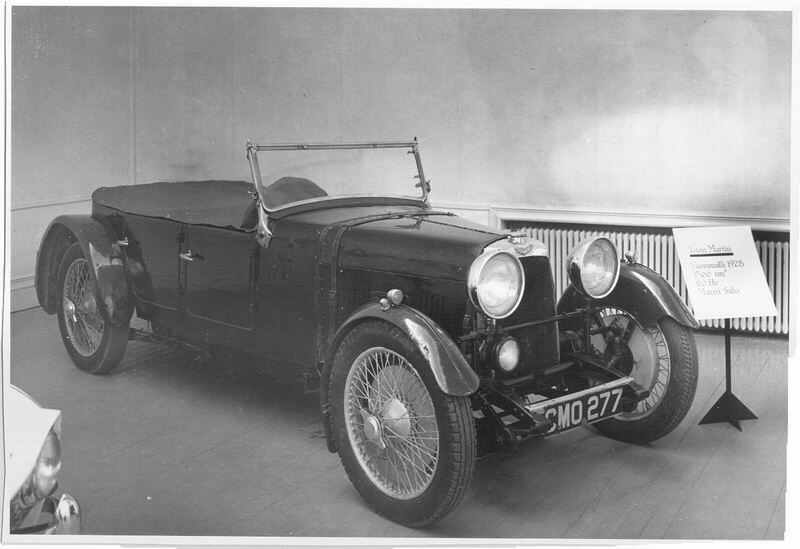 The former editor of Tekniikan Maailma Magazine, Mr Mauri Salo bought the below four-door 1928 1½ Litre Tourer from England in 1963. When interviewing Chairman Victor Gauntlett on his visit to the factory in 1988 he was asked: ”Well, Mr Salo, what do you know about Aston Martin?”, Salo replied: ”My first car was an Aston Martin!”. Gauntlett’s reply was: ”Not a bad start”.